so why allow them to be injected into muscle tissue? Sounds like some crazy witch’s brew for turning people into mice, doesn’t it? The theory of working vaccines is that you give a human a tiny weakened strain of an infectious disease, their body builds antibodies to fight it, and the next time the same disease is encountered “in the wild,” that human’s immune system is ready to fight, and better prepared. Sounds great. So why then does “modern science” infuse known neurotoxins into vaccines that cause severe allergic reactions, anaphylactic shock, autism, comas and even death? Shocking Truth: Modern vaccines are not meant to prevent disease, but to cause long-term disorders that earn Big Pharma a fortune. Yes, we know, you want to believe American medicine isn’t so corrupt, but it is. In the 1960s, vaccine manufacturers had no idea what the heck they were doing at all. Merck scientist Dr. Maurice Hilleman admitted on tape that vaccines were spreading disease instead of preventing it. 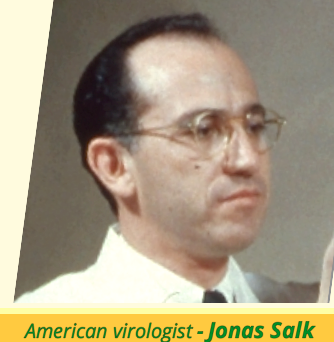 The polio vaccine contained SV40 cancer virus. Other vaccines were being produced using brain tissue from human abortions. Cell cultures from aborted fetuses are STILL used in today’s vaccines, including WI-38 and MRC-5. If you don’t believe it, check the CDC’s own vaccine ingredient web pages right here. The polio vaccine is a complete hoax and is based on a complete misrepresentation of historical data, that duped over a hundred million Americans. How? The infamous Dr. Jonas Salk (fake hero), removed the kidneys of rhesus monkeys, cut them into tiny pieces, placed them in vials with a nutrient solution and three strains of polio, and then literally rocked the bottles (like a newborn baby) using a mechanical machine. This “incubator” stimulated growth of the virus. The formula was then diluted and weakened with formaldehyde (they call it attenuated today), chilled, and shipped to laboratories around the world. Voila! The amazing useless polio vaccine was invented and the hoax was sold to the world by the CDC. Now check out this video, censored by Facebook, that’s now available at this REAL.video link, featuring Robert F. Kennedy, Jr. of the World Mercury Project, warning America about the epidemic of vaccine-induced degenerative disease. If the science of vaccines was legitimate, then the mass media would let the science speak for itself. Learn the risks for yourself. The pro-vaccine cult is “anti-science” themselves, knowing the truth about the toxins in vaccines would change millions of minds about what they call “modern medicine.” There are immunization alternatives. Check NaturalPedia.com for more solutions.